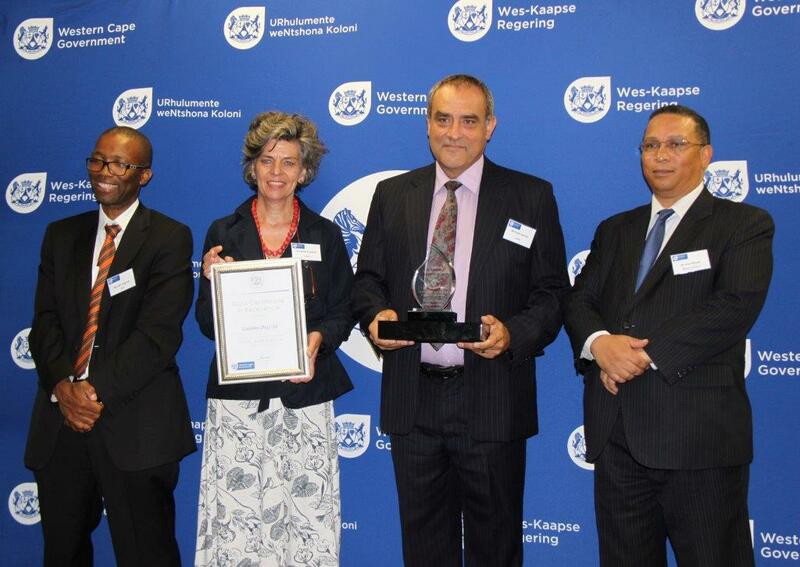 The Western Cape has been officially confirmed as the country’s Top Province in the 2015/16 provincial and local audit outcomes during a ceremony held on Monday, 10 April 2017 where deserving provincial and municipal departments as well as entities were awarded by representatives (Mr Solly Segooa and Ms Sharonne Adams) of the Auditor-General of SA. The Province also achieved clean audits for 12 of its 13 departments. A total of 23 out of 30 Western Cape municipalities were also awarded clean audits. This is the fourth year running that the Western Cape has led in audit outcomes in South Africa, with the 2015/16 audit outcomes being the best to date. The Western Cape Government was officially certified with 100% unqualified audits and Casidra was amongst the recipients that were acknowledged for its clean audit. Our Board’s vice-chairperson, Dr Leonie Coetzee and CFO, Freek van Zyl, attended the event to receive Casidra’s award. Representing the Western Cape Government at the awards ceremony, Finance Minister, Dr Ivan Meyer, said “the Western Cape Provincial Treasury actively supports municipalities and provincial departments to promote good governance, strengthen financial management and encourage accountability. While we celebrate, we are mindful that we cannot rest until every Rand is responsibly accounted for”. “We wish to congratulate all professionals at provincial and local level for their commitment to helping us build this capable state,” said Minister Meyer. “I wish to thank the Auditor-General and his team for the professional relationship they have maintained since we came into office. We will continue working closely with his team towards the Province’s vision of a highly skilled, innovation driven, resource efficient, connected and high opportunity society for all,” said Premier Zille.